In 2010 I was looking at a boat I loved, but couldn't identify until going on-line and discovering it was a Chrysler 22 before TMI bought the line from them. 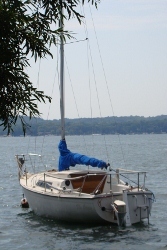 I bought it, joined this site in 2010 and began an 8 yr. journey to re-build my boat. And whatever I couldn't figure out, I knew someone here would have the answer to. About a year ago I sold the TMI and didn't want to come on the site to say that because it felt like this would be another goodbye. Anyhow, I completely finished restoring the boat and had a fun sale. It was fun because we took her out on Lake Geneva in 30 mph winds with 45 mph gusts. It was the only time I sailed her since the re-build and they are great boats! I also tell myself it was fun so I don't recall the feeling of kissing goodbye to thousands of dollars and many hours of work. But the buyers were neat people. The moral of the whole story is I discovered that if one is re-building a boat, do it for a hobby. Not for money. While I was working on my TMI22, numerous guys on the site wanted pictures to see what the C22 became. I took a bunch of them after I was done with the project and emailed them to Scott. So I expect he will be posting them soon. Many thanks to those who offered help. And best wishes to you that are making your boat better again. I am 70 this year and my new project is building a 14' wooden skiff to take the grandkids sailing. Already planning my personal little cruiser to build after that. I will check in now and then to make sure the site is still populated with crazy sailors! lolol I hope so! I think I have more fun working on them than sailing.